Mahira Khan is on the direct hit of the Maharashtra Navnirman Sena controversy. Her Bollywood debut release is also approaching and MNS is threatening that they will not let the film release due to the presence of Pakistani actress. 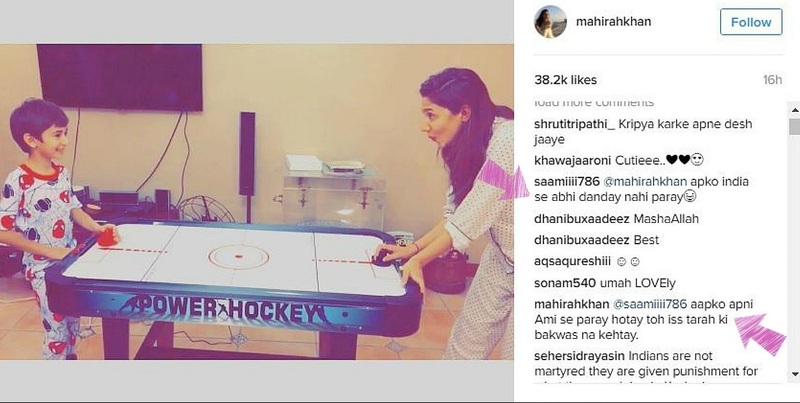 As the haters are commenting, Mahira is all set to handle them! Lately a person made a very rude and stupid comment on a photography of Mahira and her son. Saami786 said, “apko india se abhi danday nahi paray”. Mahira, gave the guy a very perfect answer “aap ko apni ammi say parhe hotay toh iss tara ki bakwaas nahi kehte. The commenter, was a guy who belonged to Pakistan and criticized Mahira for working in Pakistan but soon Mahira friends gave him detailed answers for all his questions. Few messages from Mahira’s Fans are mentioned below, have a look.